Born in Montreal in 1923, Jean-Paul Riopelle studied at the École Polytechnique (1941) and at the École des beaux-arts de Montréal (1942-1944), attending Paul-Émile Borduas’ workshop and joining the Automatistes group with whom he signed the “Refus Global” manifesto in 1948. In the late 1940s, he also settled in France where he briefly entertained ties with members of the Surrealist movement. These experiences had considerable impact on Riopelle’s early practice, in which he developed a unique visual language based on spontaneous gesture and repetition, creating beautiful abstract works by throwing colorful spurts of paint in filament-like marks that embrace the entire pictorial surface. During the first half of the 1950s, he graduated to a mature style, working a thick impasto from paint applied directly from the tube and shaped with a spatula in an “all-over” fashion that suggested parallels with Abstract Expressionism. Rendering large-scale paintings that incorporated captivating contrasts and textures in mosaic-like compositions, Riopelle quickly gained international notoriety. Starting in the late 1960s, he started spending more time in Canada, eventually returning to Quebec. His work from the 1970s and 1980s is marked by a gradual return to representative forms inspired by the animal theme, and by the artist’s adoption of a new technique based on the use of stencils and aerosol paint. One of Canada’s most prominent artists, Jean-Paul Riopelle distinguished himself amongst his contemporaries and his art continues to draw international attention today. He received an honorable mention from the Guggenheim International Award in 1958, participated in the Venice Biennale (1952, 1954, 1962) and the São Paulo Biennale (1955). Major solo exhibitions of his work were presented at the Kölnischer Kunstverein in Cologne (1958), the National Gallery of Canada (1963) and the Musée du Québec (1967). In 1982, The Musée d’art contemporain de Montréal hosted “Jean-Paul Riopelle : peintures 1946-1977”, an exhibition organized by the Centre Georges Pompidou in Paris and by the Musée national des beaux-arts du Québec. In 1991, the Montreal Museum of Fine Arts also organized a major retrospective of the artist’s work which then travelled to the Hermitage Museum in St. Petersburg. Riopelle received several honorary degrees, notably those delivered by the University of Manitoba (1972) and by McGill University (1968). He was made Companion of the Order of Canada (1969) and won the prestigious Prix Paul-Émile Borduas (1981) as well as the Grand Prix de la Ville de Paris (1985). Riopelle died on March 12, 2002 in Île-aux-Grues, Québec, at the age of 78. 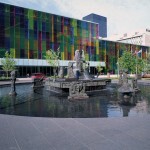 The only fountain-sculpture made by Riopelle (1923−2002), La Joute, 1969-1970 (cast circa 1974) is an imposing sculptural grouping located in the Quartier international de Montréal. 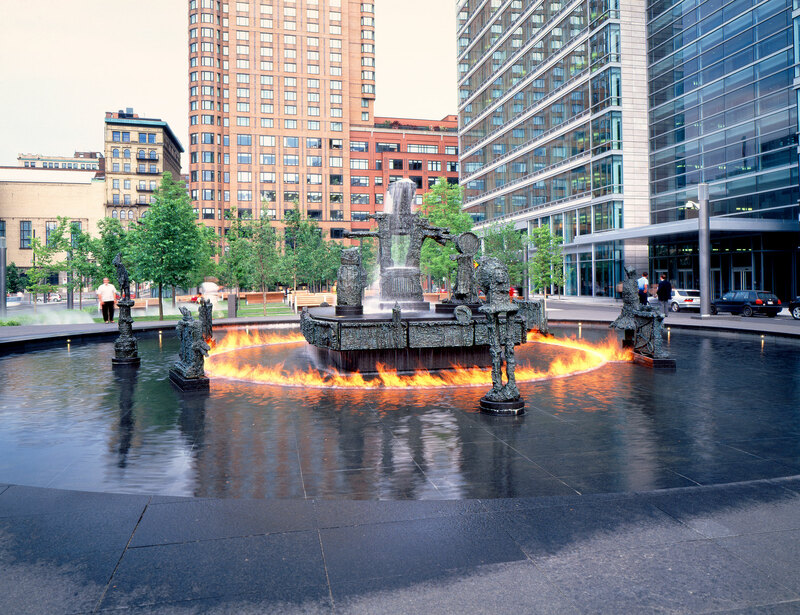 Initially installed at Montréal’s Olympic Park for the 1976 summer Olympic Games, La Joute has stood, since 2004, in the square dedicated to the artist. The 30 elements that surround the “Tower of Life” depict various animal and mythological figures that marked this great artist’s childhood and imagination, including the Owl, the Fish, the Bear and the Dog. Since it was reinstalled, the work has included a circle of fire, as Riopelle originally envisioned. 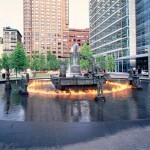 During evenings from mid-May to mid-October, flames rise in a fantastic show of mist and light. * Renovation work is underway on the La Joute sculpture. Through July 20, 2018, the sculpture’s appearance may be altered.